I took a break from emptying my house to go to Rebecca Roanhorse reading at the bookstore. Worth it! I'm still prepping my house for the remodel, pulling everything out of the back half of the house and finding a place to put it in the front half. So, basically, I have to handle every thing I own and decide, Do I want to keep this? and If so, where am I going to keep it? I am sure it is a salutary exercise, but I find that each of these things pulls me out of the now into regrets about the past, hopes/fears about the future, or just wishes for the present to differ from what it is. The longer it has been since I used the thing, the harder it pulls. I did the books first; that was good. I don't feel sad about the fact that I won't have time to read or reread all of these books. I do regret each book I meant to review, and didn't. But having lots of books -- each one a potential box of delights -- does make me feel at peace with myself and at home in the world. 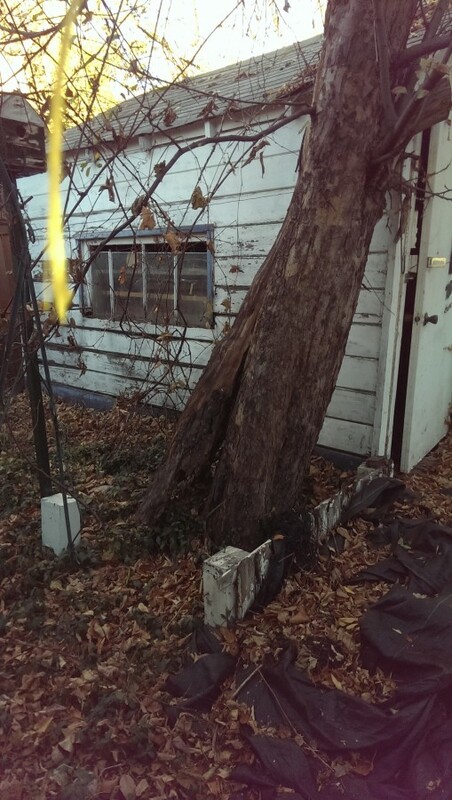 + When I bought this house it came with a very big, very old apple tree. - Which suddenly started to lean. + It didn't fall over and hurt anyone. + I found a very competent, honest, and kind tree guy who took the tree the rest of the way down without damaging anything else except an old birdhouse where yellowjackets had been nesting. - He discovered that the tree had not been taken out by old age. It had been killed by carpenter ants or termites. I thought termites didn't live around here, because the winters are too cold and dry, but I believe tree guy would know. - but I can't ask an exterminator to look into the shed until I make it safe, so I don't know where to start. - Also I am feeling guilty about not having realized that I needed to do something earlier. Bitter Seeds, by Ian Tregillis. For the book group that meets tonight. Not going to finish it, partly because I kept losing it but mostly because it is so boring. I just found it again, though, so I will read some more before book group so I can make a better statement of what is wrong with this book. Although I think the what is wrong showed up in the first pages: We've got ravens, atrocities, the aftermath of war, special children, atrocities performed on special children, the First World War setting the stage for the Second, British class issues, and demon-summoning. There's a little girl, a special little girl, with Gypsy blood in her. The first action we see her take is to surreptitiously trick a towheaded boy into coughing, so the mad scientist decides that he's not healthy enough, has him disposed of with a shovel, and chooses her and her brother for experiments. I realize that Tregillis could be setting up a sneaky tricksy female Gypsy trope in order to knock it down, but it hasn't happened yet. ETA: When I flipped to the end to learn how many pages of boring there were (428) I discovered that this is the first book of Ian Tregillis's Milkweed Triptych. Ancillary Justice, by Ann Leckie. You know how everyone has been telling you how good this book is? It really is. And the Mountains Echoed, by Khaled Hosseini, for the book group that meets Sunday. Since I got back from Wiscon I've been trying to comply with a Weed Violation Notice from the city. I think I have fixed it, but the way you find out whether the city is satisfied is by not getting a ticket, so... we'll see. Also I learned that the raccoons that were banging on my roof late winter have torn off some siding and moved into the attic. So I feel even more like the ladies of Grey Gardens than usual, even though I'm not putting out food for them. Technically my neighbors aren't putting out food for the raccoons either; they're putting it out for the feral cats. Fortunately I do not live in one of the states that says trapped raccoons can't be relocated, only euthanized.